Zoho One is an innovative and comprehensive suite of business applications. The platform places complete administrative control in the hands of users at an affordable price. Administrators and owners are also afforded full supervision over business data, from employee management and team guidance to work processes and security policies. With Zoho One, entrepreneurs and businesses can also bring their work with them on mobile devices through native applications for Android and iOS. These apps give users the same experience they get when they are on a desktop or laptop with just one login and password. An all-inclusive platform like Zoho One enables users to access correct information anytime and anywhere, encouraging employees to be more productive and efficient. 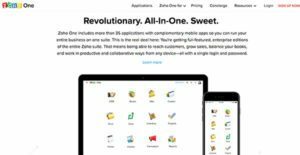 Zoho One is a full-featured platform that is equipped with more than 35 applications that enable businesses of all sizes to increase their sales, promote their products and services, and manage back-end processes. The software also supports communication between teammates and customers for to facilitate smooth workflows. With Zoho One, businesses can connect their teams and integrate their workflows for a smoother intra-organizational efficiency. Applications included in the platform allow different groups to communicate and collaborate with workmates in the same team and in others. This enables people to get the right information at the right time. Also, Zoho One is a way of mitigating IT expenses because the platform connects each department at less the cost. Zoho One enables users to access the platform on their desktop and laptop computers as well as on their mobile devices with a single, secure account. This makes accessing the software’s features more efficient. It also helps administrators maintain tight control over business data and security policies. Zoho One does not work alone. It is connected with other applications to create an ecosystem of custom apps and extensions available in the Zoho Marketplace that make the platform extendable. If you are interested in Zoho One it could also be sensible to examine other subcategories of Best Business Process Management Software collected in our database of SaaS software reviews. There are popular and widely used solutions in each software category. But are they necessarily the best fit for your organization’s unique wants? A popular software solution may have thousands of customers, but does it present what you need? For this reason, do not blindly shell out for popular systems. Read at least a few Zoho One reviews and think about the elements that you wish to have in the software such as the cost, main functionality, available integrations etc. Then, shortlist a few solutions that fit your wants. Check out the free trials of these products, read online opinions, get explanations from the seller, and do your research meticulously. This profound groundwork is certain to aid you select the most excellent software application for your company’s unique wants. How Much Does Zoho One Cost? A 30-day free trial is available for interested entrepreneurs and businesses. We realize that when you make a decision to buy Business Process Management Software it’s important not only to see how experts evaluate it in their reviews, but also to find out if the real people and companies that buy it are actually satisfied with the product. That’s why we’ve created our behavior-based Customer Satisfaction Algorithm™ that gathers customer reviews, comments and Zoho One reviews across a wide range of social media sites. The data is then presented in an easy to digest form showing how many people had positive and negative experience with Zoho One. With that information at hand you should be equipped to make an informed buying decision that you won’t regret. What are Zoho One pricing details? What integrations are available for Zoho One? If you need more information about Zoho One or you simply have a question let us know what you need and we’ll forward your request directly to the vendor.